Right next to Boundary Rd. where No. 1 Chinese Restaurant used to be now sits a new Chinese-operated Japanese restaurant named Hiro Sushi. 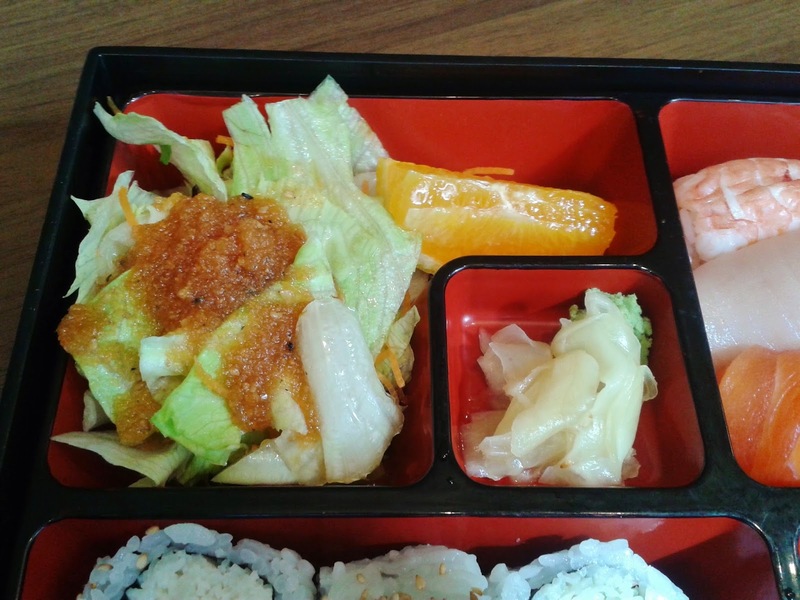 Having had multiple lunches from other decent Chinese-operated Japanese restaurants in the area, namely Take Sushi and Osaka Sushi (yet to be blogged about), I had hopes that this restaurant would fare just as well. The restaurant was larger than I imagined and has a seating capacity of approximately 50. The walls are painted with scenery and the large sloped glass ceiling lets in a lot of sunlight during the afternoon hours. Several servers and several chefs were busy serving the guests, and the restaurant was about half full when I arrived for lunch. The Miso Soup was served almost immediately after I ordered, while the rest of the items came in a lunch box. 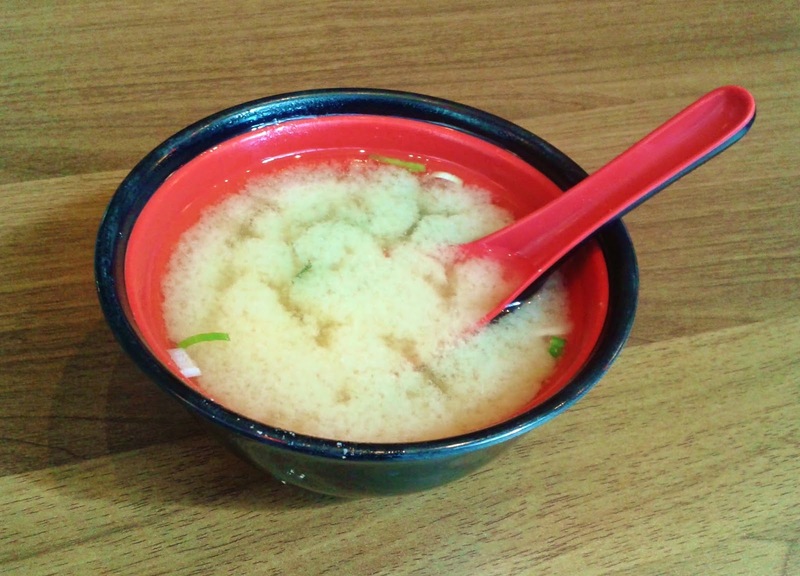 The Miso Soup was served hot and was on the milder side. It was garnished with small bits of tofu, onion and seaweed. I liked how it was neither too salty nor bland. The lunch box came 8 minutes after the placement of my order and I was pleased to find that they took the time to arrange everything neatly. 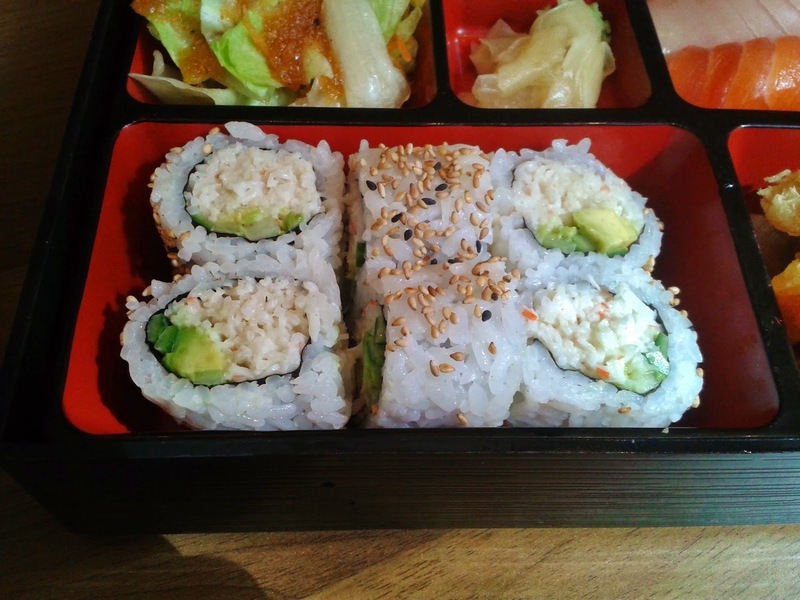 The California Roll was decorated with sesame seeds and filled with crab meat that was flaky and had a good balance of mayonnaise. It was also very neatly cut and the rice layer was not too thick. Though it was a little cold, the crab meat's mildly sweet taste made this California Roll delightful to eat. So far, things are off to a good start. The Green Salad consisted of mainly lettuce and was dressed with a citrus-based vinaigrette. The dressing was a little sweeter than the average Japanese salad dressing and has a unique "orange-y" flavour to it which I enjoyed. I wished that the dressing was spread out more evenly among the lettuce for a more uniform taste. I suppose the Fruit mentioned in the menu consists of merely one slice of orange. 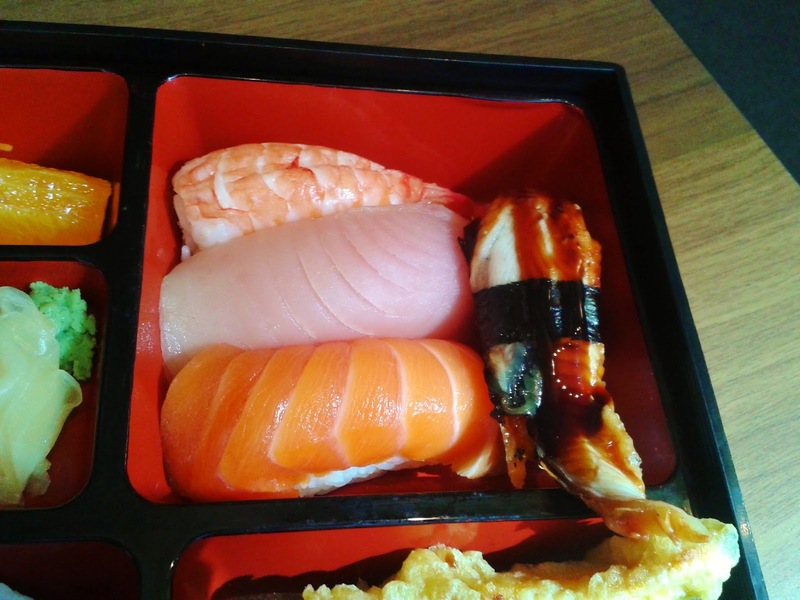 The nigiri provided with the Sushi Box was a nice way to sample a small assortment of the raw seafood. The Ebi Nigiri was very obviously marinated with ginger and was quite firm. The Tuna Nigiri had a decent, soft texture but was overly fishy in terms of taste. The Salmon Nigiri came with a large amount of salmon which was cut thick. The sushi rice could be looser in order to better match the texture of the fish. The Unagi Nigiri was missing the grilled flavour characteristic of unagi and was overwhelmed by the sweet unagi sauce that accompanied it. One piece of Prawn Tempura, one piece of Kabocha (pumpkin) Tempura, and two pieces of sweet Potato Tempura were included with the Sushi Box. Unfortunately, this was where it all fell apart. There was too much batter on every piece of tempura and the overused oil made it taste like a crunchy snack gone wrong. That being said, at least I could still taste the prawn inside the Prawn Tempura. The sweet potato was rather voluminous and had the right flavour. The kabocha, however, did not have the right flavour. It was cut too close to the edge and cooked improperly, giving it a foul taste (I will censor the words I used to describe that). Let's just move on to the next item. 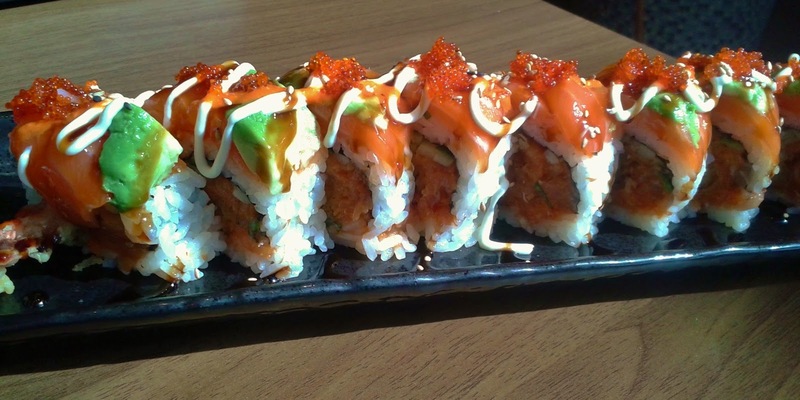 The Red Dragon Roll consisted of spicy tuna, cucumber, deep-fried prawn, salmon sashimi, avocado and tobiko. The roll is quite large and filling. The spicy tuna was soft, mashed and had a moderate amount of spiciness. There was a good amount of fresh salmon sashimi on top. 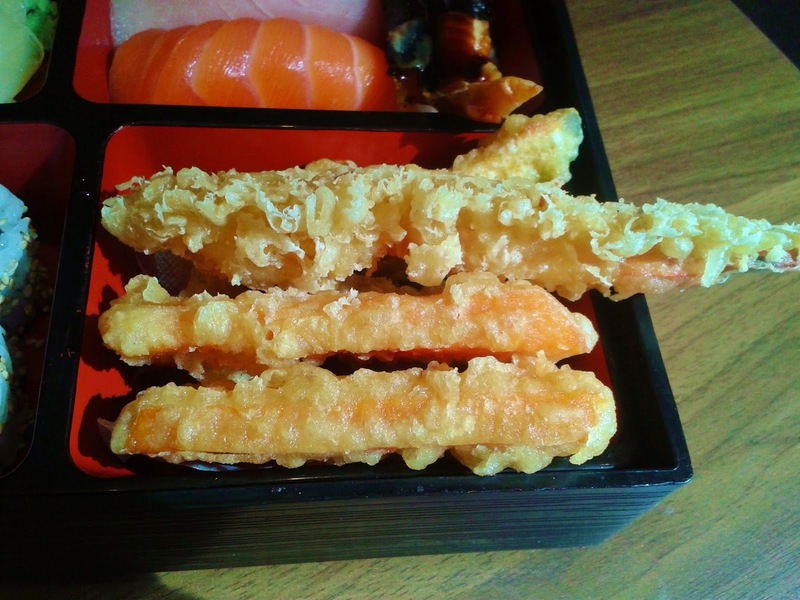 The deep-fried prawn (which was essentially prawn tempura) had the same woes as the tempura earlier. 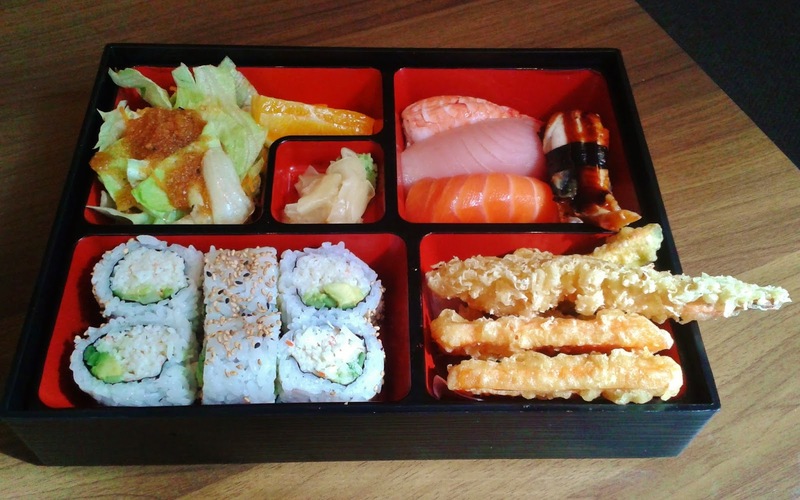 The excessive contrast in textures, with the prawn tempura being hard and crunchy and the salmon and spicy tuna being soft and smooth, reduced the harmony among the ingredients. The service was focused on efficiency and the servers kept a straight face while sounding rather direct. That being said, they were attentive enough to time the arrival of my dishes well and to clean up dishes when I no longer needed them. I could say that my visit to Hiro Sushi was a satisfying one if I had not ordered anything with tempura in it. 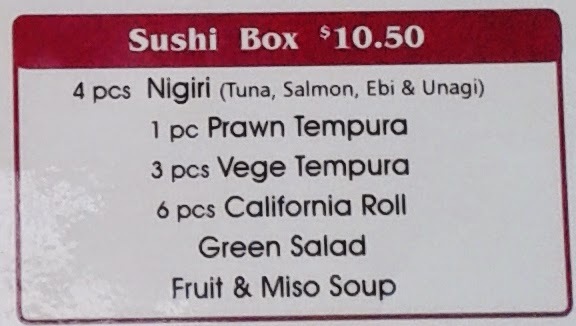 For the time being, it looks like they need to get their tempura-man checked out.